Welcome to the Nikwax blog » Nikwax Hydrophobic Down: can it stand the heat… well the rain! Nikwax Hydrophobic Down is the latest high performance, PFC-free innovation from the Nikwax lab. It provides a flexible Durable Water Repellent (DWR) finish on each individual down filament and is guaranteed to be water resistant and highly durable. To test just how high performing Nikwax Hydrophobic Down really is, Greg Care – Nikwax and Páramo product tester – took the latest Rab Neutrino sleeping bag filled with treated Nikwax Hydrophobic Down up the hill and through a rigorous test…..
Test the performance of the Rab Neutrino sleeping bag filled with European Goose Down that is treated with PFC-free Nikwax Hydrophobic Down. 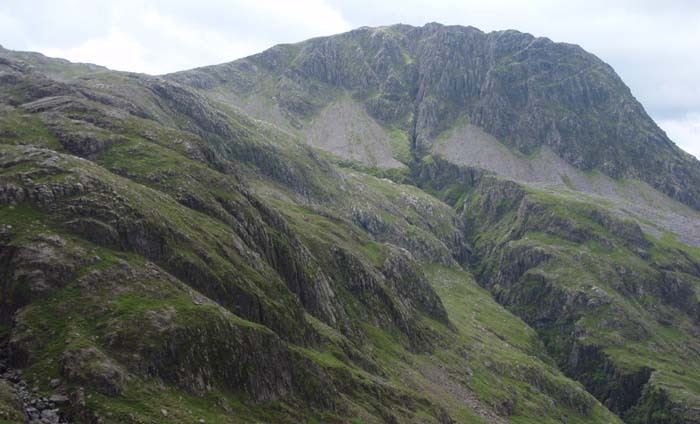 Bivouac located near to scafell pinnacle, 950 metres above cloud base on rough turf. Drizzle, turning into approximately two hours of moderate rain (raindrops audible on bivvy sack). Similar drizzle and short showers through the night. 100% humidity, light breeze beaufort 1 to 2, temperature 10.7 >8.2 C. and wind chill >7.2 C.
The sleeping bag was compressed into the bottom of my pack. The sleeping bag was dry on insertion. It lofted up nicely. The down was evenly spread. 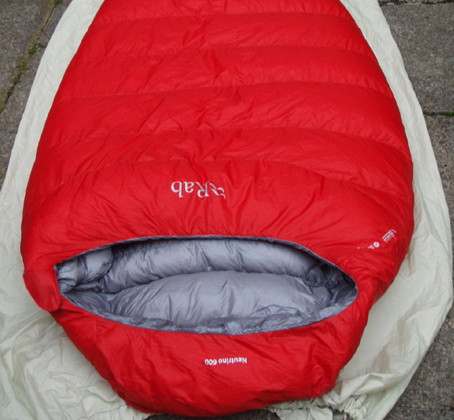 At the bivvy site, it was placed on a Thermarest inflatable and closed cell foam mat, inside a bivvy sack made of Nikwax Windproof light (that has been treated with TX.Direct). I was in the sleeping bag for 8.5 hours. I wore a Páramo Parameta Grid T-shirt base layer and Parameta T Briefs. I was able to support the opening of the bivvy sack on a walking pole to keep some ventilation near my head. 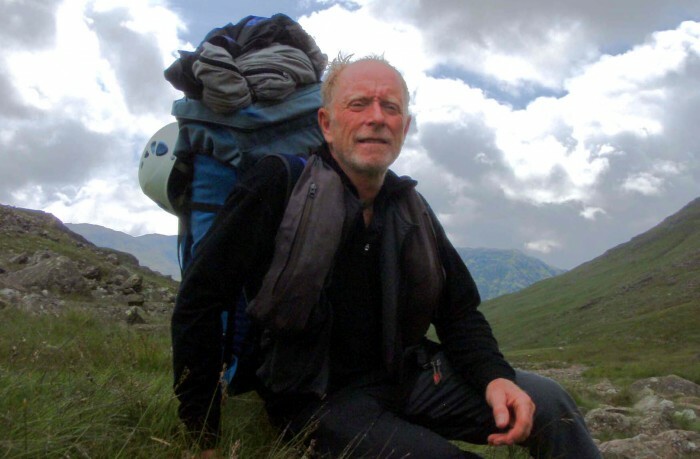 I changed position during the night but the sleeping bag lay as I had placed it – facing up. I adjusted this slightly to move the zip to a less exposed position. There was a steady build-up of moisture on the inside of the bivvy sack from condensation and rain ingress over the first hour. The upper surface of the sleeping bag became wet. My body temperature was comfortable. I slept well and only awoke during showers when raindrops could be heard on the bivvy sack. When I emerged in the morning the rain had abated, but above the cloud base humidity remained at 100%. I felt warm and dry. There was substantial wetting to the bivvy sack and the sleeping bag surface. I got out of bed and inspected the bivvy bag and the sleeping bag. I took off the bivvy sack and laid the sleeping bag flat. The outer fabric was wet and I would estimate that the loft had reduced by 10 to 15%. The down distribution was mostly intact but it did not fill the panels as completely as when dry. There was more displacement in the foot panel, where the down had shifted out of place. There was no evidence of clumping (down-forming balls), which I would have expected with this degree of wetting. The inside of the bag was dry except for slight damping under the hip and foot areas. The wet bag was replaced in the bottom of the pack and remained there for nine hours – this was to represent the time it might remain in a pack during a long day on the hill. The dampness and compression in the bag typically leads to a lack of immediate down expansion and as expected, when removed from the pack, the down had clumped. The bag was given a good shake to redistribute the down and hung over two chairs in my yard at 4pm. It was 18.C, with 70% humidity, little air movement and no direct sunlight. After one hour the bag was shaken out and checked. The inner and outer fabrics had dried and the down expanded evenly in the quilting, with no clumps left. The sleeping bag was replaced in its cotton storage bag. I have not used down insulation for living in snow shelters or bivouacs for some years due to its unreliability in wet conditions, but in the Nikwax Hydrophobic Down filled sleeping bag I had a comfortable night, despite the damp conditions. After one wet night, the down retention recovery of loft in the Rab Neutrino was far better than I expected. The recovery of the down in this bag after wetting and compression was impressive and represents an improvement in the bags ability to maintain consistent insulation in damp or wet circumstances.